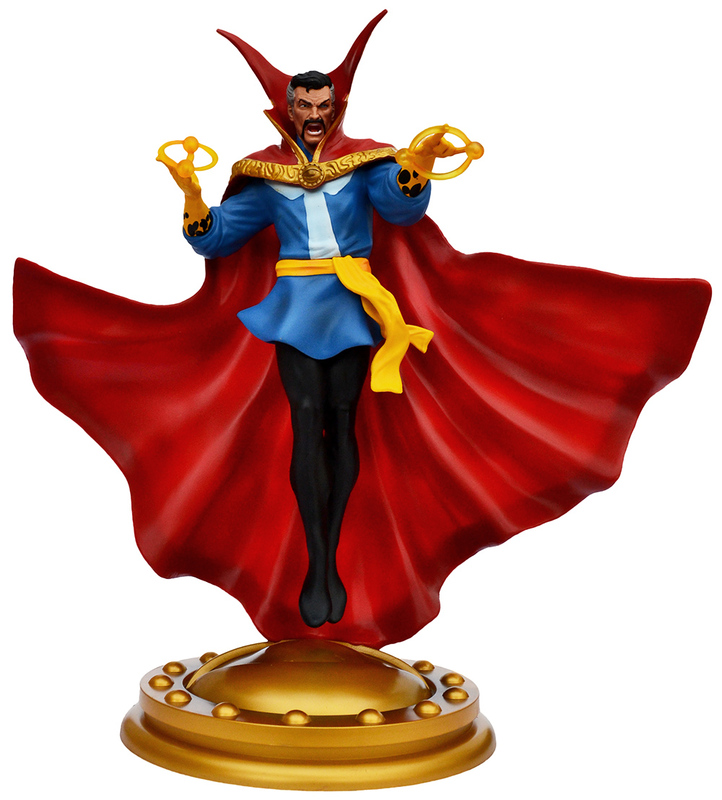 REVIEWED: Doctor Strange Statue (Diamond Select Toys) | 'TAIN'T THE MEAT… IT'S THE HUMANITY! This week’s entry marks a landmark for Taint The Meat — it’s our 300th post. Over the last few weeks I’ve been considering the most appropriate subject to help celebrate such an anniversary. Something comic related? Obviously. Something eye-catching and impressive? No doubt. And something pretty awesome? Definitely. 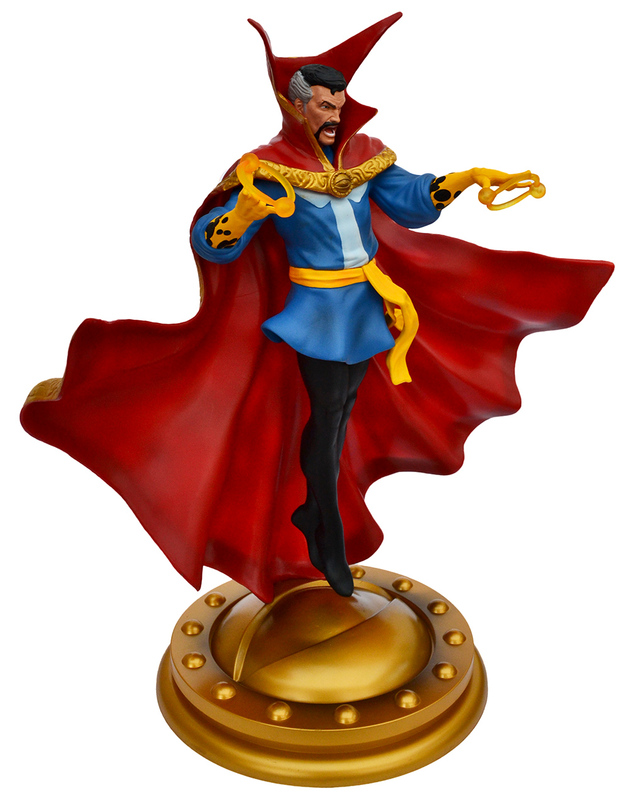 Then I saw this wonderfully dramatic Doctor Strange Statue from Diamond Select Toys — problem solved! 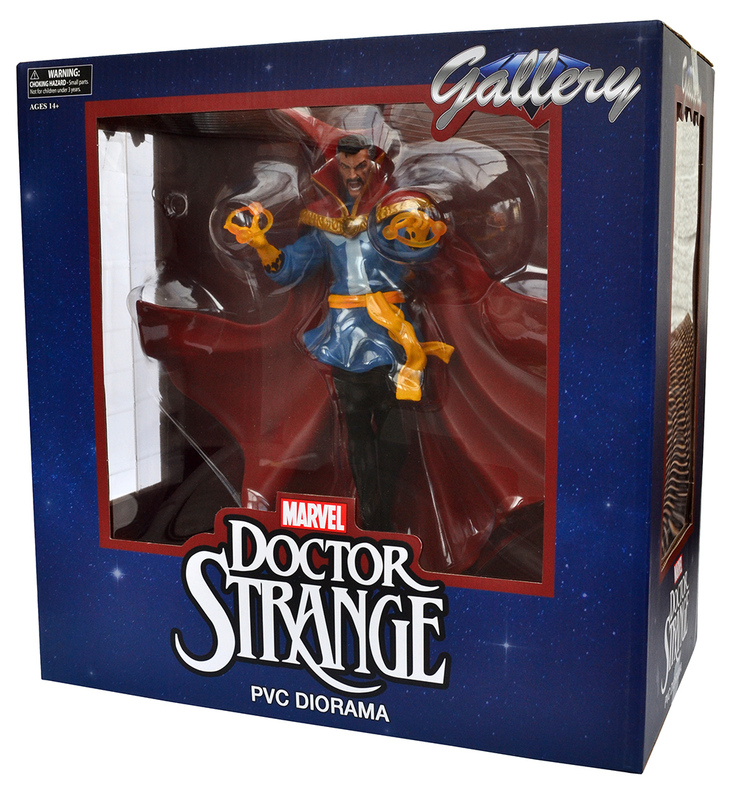 Marvel Comics’ very own Master of the Mystic Arts, Doctor Strange has been immortalised in this Gallery PVC Diorama, released by Diamond Select Toys in the UK in early 2017. The painted statue measures an impressive 13 x 12 inches, and is sculpted by artist Phil Ramirez. Apart from the statue’s size what makes this piece truly impressive is its price tag: it retails for only £45. For a statue this size that’s quite remarkable, placing it in the same price bracket as Kotobukiya’s smaller ARTFX+ range of statues, and only a couple of quid more than the rather puny 6-inch 2000A.D. action figures by 3A. By the Wondrous Wands of Watoomb, the Doctor is in! The one-piece statue ships in a large box measuring 13.5 x 13.5 inches, with transparent windows in the front and sides so the piece is clearly visible. The statue comes encased in a two-piece studded blister pack, with a separate piece of moulded plastic to protect the tip of the Doctor’s cloak, just behind his feet (a nice touch). The packaging is sturdy, the statue well protected, and it arrived whole and undamaged. Also included was a colour leaflet showcasing other Marvel statues in Diamond Select’s Gallery range. By the Ruby Rings of Raggadorr! Strange ‘floats’ above a large golden Eye of Agamotto base. 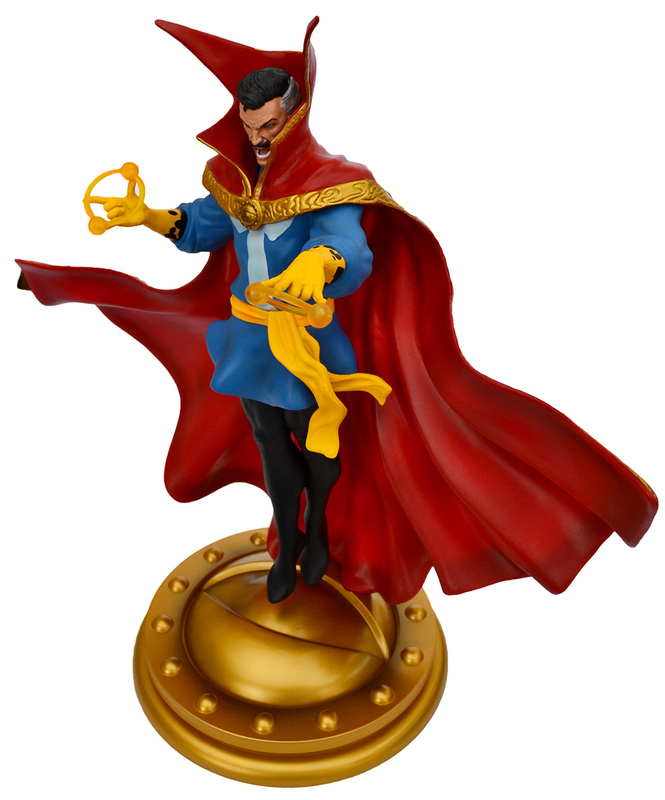 The statue itself depicts an impressive Doctor Strange levitating above a golden base modelled on his mystic totem, the Eye of Agamotto. Strange’s hands are outstretched as spells begin to form at his fingertips, and the look on his face shows the Doctor is clearly ready for action. It’s a wonderfully dramatic statue, one that just crackles with energy and drama. I particularly like the dramatic sweep of the Doctor’s trademark Cloak of Levitation, and the clever way that the statue has been sculpted so it looks as if Strange is levitating. By the Crimson Bands of Cyttorak, Strange is ready for battle! 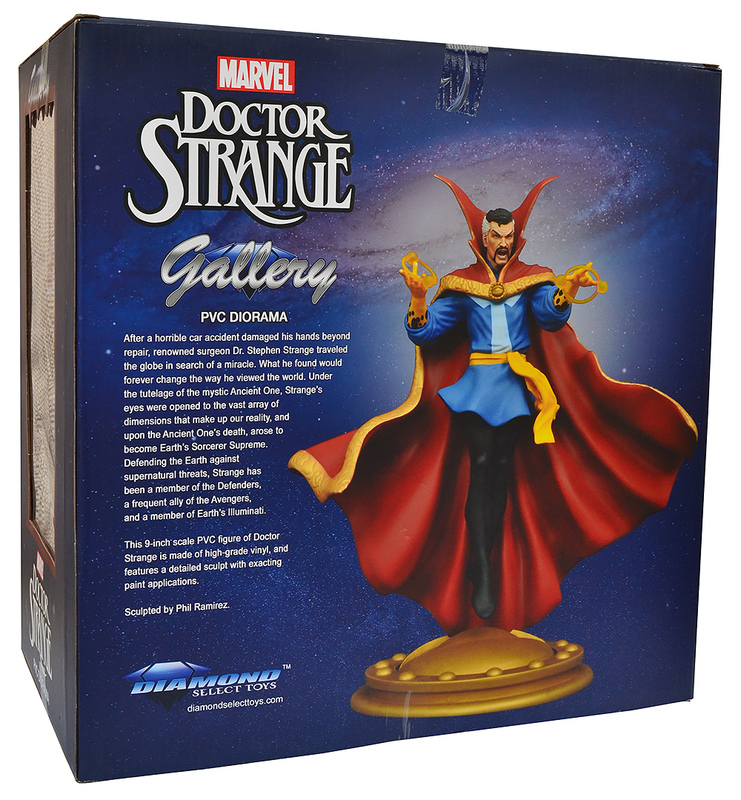 The moulding of the statue is of an extremely high quality with some great detailing, particularly around Strange’s face. Colours are bright and punchy, with some nice tonal colour variance in both Strange’s cloak and his costume. 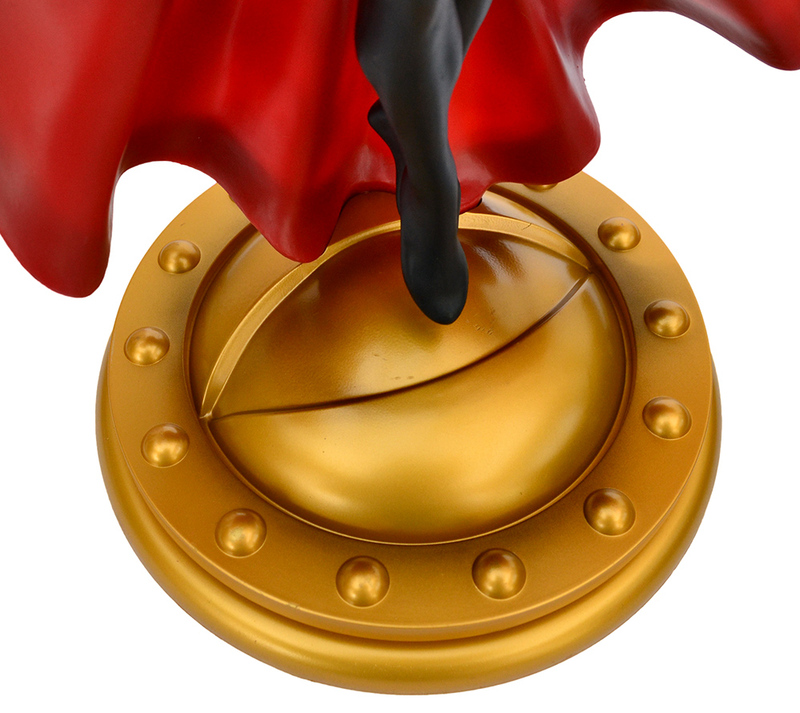 However, there are a few minor painting errors where the paint overlaps the edges, particularly on the gold trim of the cloak. But for £45 price tag I can forgive those small mistakes, and they certainly don’t detract from the statue’s overall impact. In the Name of the Dread Dormammu, this Doctor Strange statue impresses from all angles. Since the statue is made from PVC it feels quite light when you hold it, however that’s really not a problem when the piece is on display. 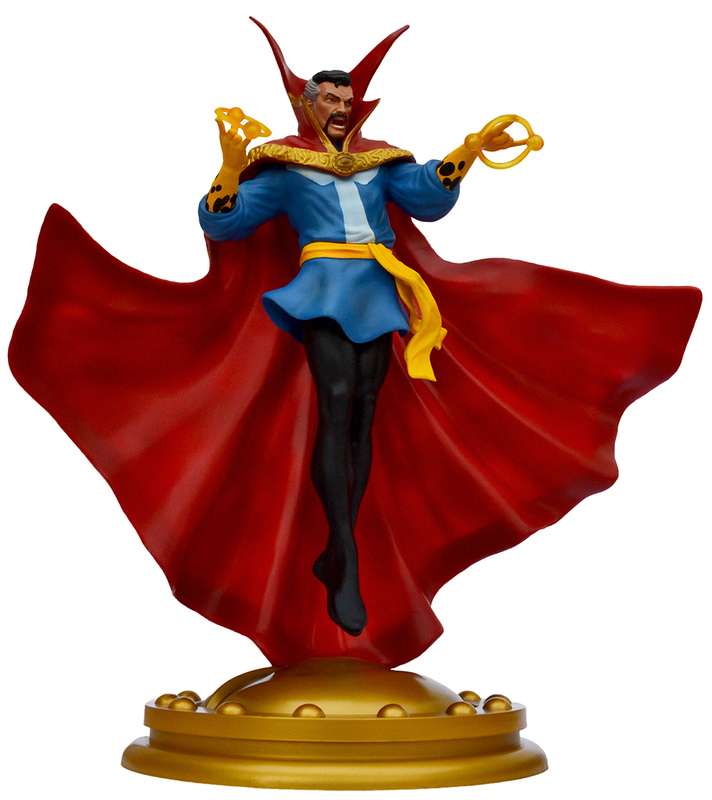 I’ve been a big fan of Doctor Strange since I first read his reprinted adventures in a Marvel Pocket Book when I was a kid; the character, created by Marvel Comics legends Stan Lee and Steve Ditko, has always been a favourite of mine, and this statue really does do the good Doctor justice. The Doctor Strange Statue, from all sides. Diamond Select Toys have released a large range of Marvel statues in this Gallery PVC range, including Spider-Man, The Incredible Hulk, Deadpool, and Captain Marvel, along with many others. The Iron Man statue looks as impressive as this Strange one, and when I inevitably get one — sometime very soon I suspect — I’ll share my thoughts on it (click here). By the Omnipotent Oshtur! £45? What a bargain! 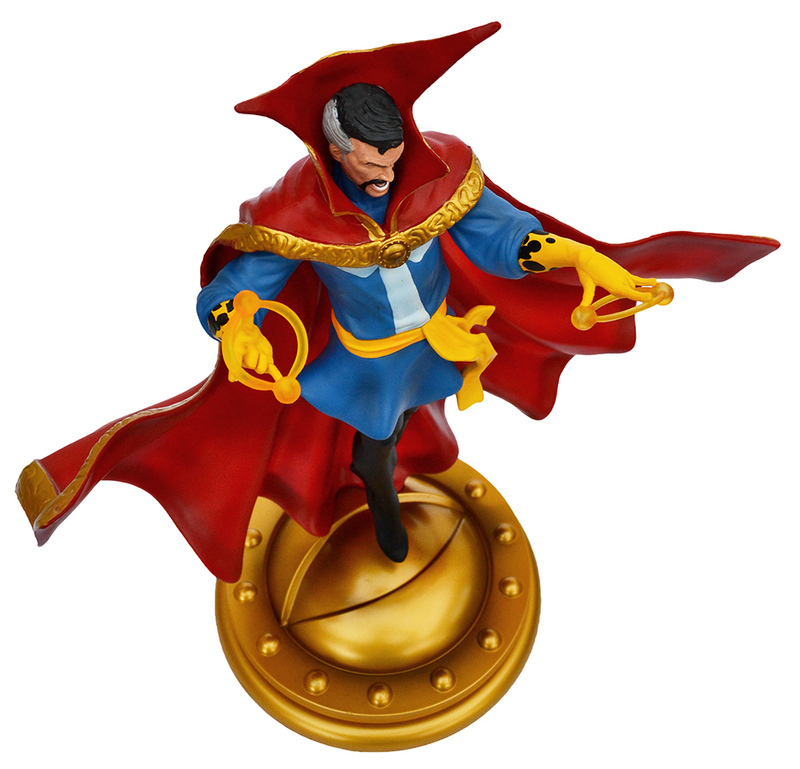 The Doctor Strange Statue is readily available and well worth a go —it’s a great looking piece and for £45 you really can’t go wrong. For those with an existing statue collection it easily holds it own with more expensive pieces, and for those wishing to start a collection this is an excellent place to start. May the Hoary Hosts of Hoggoth be praised!